Large Red & White Snowflakes Gourmet Window Totes have rope handles and clear acetate windows. 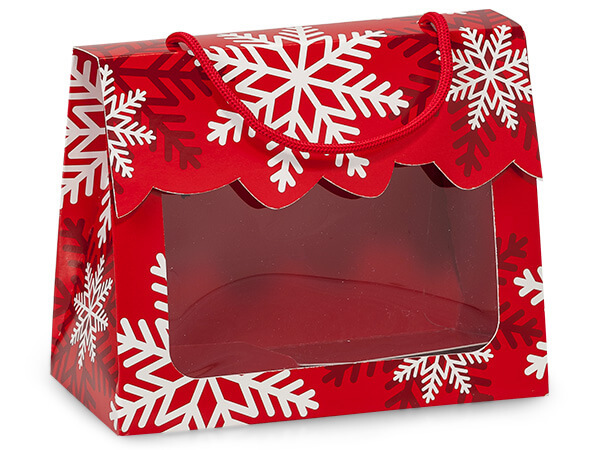 Gourmet window gift boxes have rope cord handles and are printed in the interior of the box. The small boxes have 7" rope handles for easy carrying, and a 2 x 3-3/4" acetate window in the front. Hook and loop closures hold the die cut fold over flap closed. The large boxes have 8-1/2" rope handles, and a 2-3/4 x 5" acetate window in the front. These boxes make a perfect presentation for your gourmet products. We recommend a food safe barrier such as a clear cello sheet, cello bag, or waxed food grade tissue.